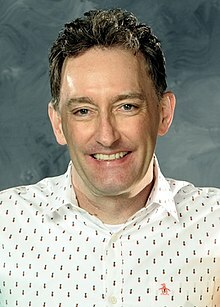 توم كينى (انجليزى:Tom Kenny), ده ممثل امريكانى كوميدى, اتولد يوم 13 يوليه 1962, اشتهر كينى بتمثيل صوتى بدور سپونچ بوب. ↑ "Tom Kenny: Biography". T.V Guide. Retrieved 21 September 2012. ↑ "Tom Kenny, voice of SpongeBob SquarePants, talks of local ties, life in Bikini Bottom". TimesLeader.com. Times Leader. Archived from the original on March 4, 2016. Retrieved June 10, 2015. ↑ "Tom Kenny Finds his Voice as SpongeBob SquarePants". backstage.com. Retrieved June 22, 2017. ↑ "Barry Crimmins's Life-Changing Comedy". The New Yorker. Retrieved June 22, 2017. ↑ "Louis C.K. directs CNY comedy legend Barry Crimmins' first-ever standup special". syracuse.com. Retrieved June 21, 2017. ↑ Wojciechowski, Michele (April 21, 2015). "Voice Artist Tom Kenny on Being SpongeBob SquarePants". Parade. Retrieved July 15, 2016. الصفحه دى اتعدلت اخر مره فى 8 ديسمبر 2018,‏ 10:03.